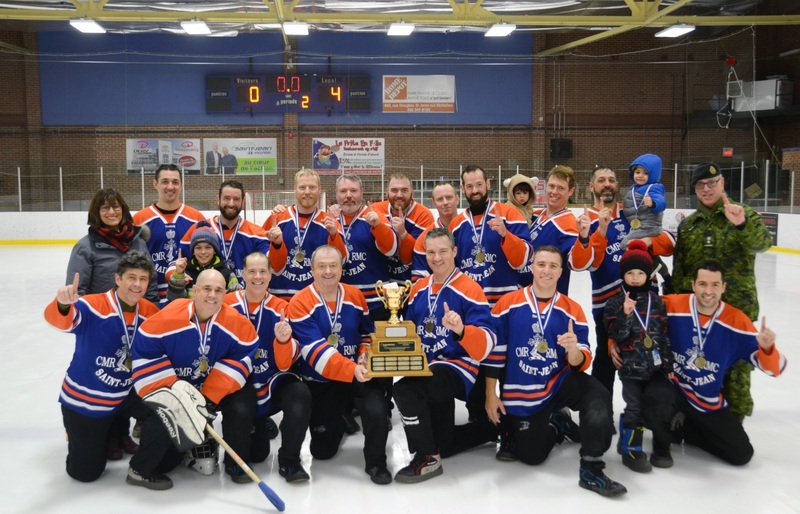 Sports: Carr-Harris Action, Broomball Photos, and More! Kingston, Ont. (February 7, 2019) – The RMC Paladins (6-19-2) reclaimed the Carr-Harris Cup in dominant fashion on Thursday night, beating the Queen’s Gaels (18-9-0) 5-1 in front of a Carr-Harris record crowd of 3,888 at the Leon’s Centre. Paladins head coach Richard Lim credited RMC’s effort from everyone on the roster in the victory. The Paladins opened the scoring on rookie Liam Stagg’s (Halifax, N.S.) first goal of the game 12 minutes into the period just after an RMC power play. With an assist on the play, Cameron Lamport (Newmarket, Ont.) extended his point-streak to nine games. Four minutes later, Rhett Willcox (Surrey, B.C.) took a drop pass from Bennett Huber (Calgary, Alta.) and beat Gaels goalie Justin Fazio (Sarnia, Ont.) with a slapshot to the top corner, elating the Paladins faithful. It was more of the same from RMC in the second period, as Alex MacDonald (Windsor Junction, N.S.) netted another for the Paladins 32 seconds into the second frame. Just over a minute later, Stagg was left alone in front of the Queen’s net, tipping in his second goal of the game. Spencer Abraham (Campbellville, Ont.) scored for the Gaels to break Austin Hannaford’s (Calgary, Alta.) shutout, marking his 116th point for Queen’s, which ties him with Aaron Fansen for first all-time in points for a tricolour defenceman. Scoring the final goal of the night, Lamport skated the length of the ice before burying the breakaway goal five-hole. Hannaford ended the game with 46 saves for RMC to the sound of Paladins fans chanting his name. Stagg and Abraham were named the game’s MVPs, each earning the Mary Carr-Harris Most Valuable Player Award for their respective teams. 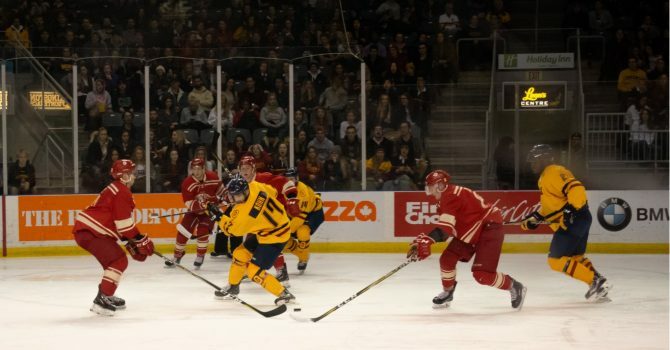 Queen’s hosts McGill on Saturday in their final game of the regular season before starting their playoff run. The Paladins will close out the season on Sunday when they host the Nipissing Lakers at 2:00 PM. RMC will honour their seven graduating players before puck-drop: David Savery, Owen Gill, Bennett Huber, Dylan Giberson, Deric Boudreau, Torin O’Brien, and Michael Desgroseillers. For LOTS more photos from the game click here. 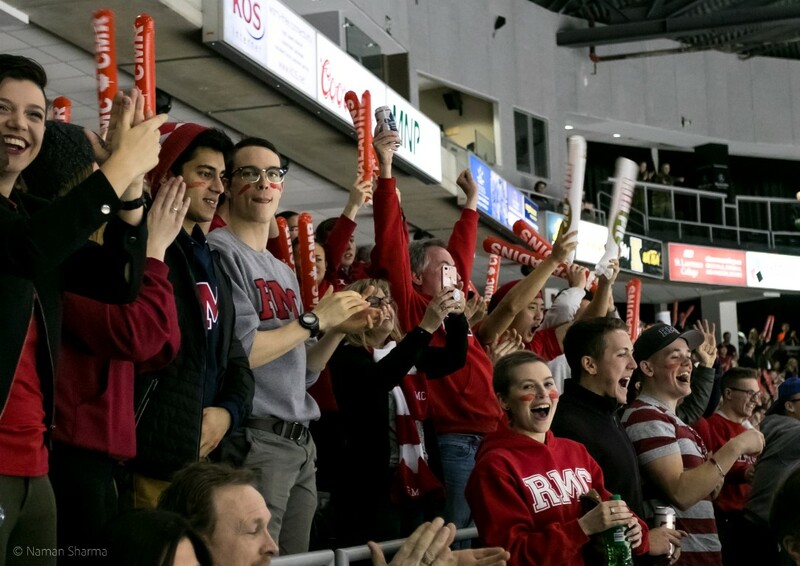 This past Thursday (February 7th, 2019), the RMC Paladins took on the Queen’s Gaels in the annual Carr-Harris Cup at the Leon’s Centre in Kingston, Ontario. This rivalry in particular is one that has been ongoing since the two schools were created. 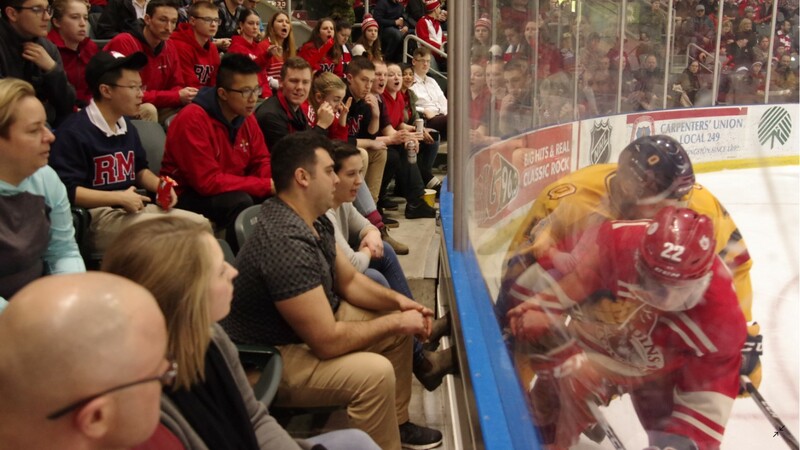 While it’s easy to argue that one school is better than another, events like the Carr-Harris Cup make it clear. The game began with the ceremonial puck drop to signify the start of the game. This year however, things were a little more special: one of the special guests was RMC’s College Sergeant Major, Chief Warrant Officer Garth Hoegi. This year, CWO Hoegi will be retiring after over 30 years of service in the Canadian Forces. As he was introduced at center-ice, the entirety of the RMC representation broke out cheering and chanting his name as a heart-warming goodbye. Then the game kicked off. It was intense and full of action. By the end of the 2nd period, the score was already 4-1 for RMC. Every goal was met with a wave of unmatchable energy as the entire RMC side of the arena stood up and celebrated. And the rest of the night is history. I can personally say that the game was beyond exciting and a night to remember. Seeing RMC win against Queens despite a rough record was bitter sweet. I think I can speak for the rest of the College when I say that we’re all proud of the team’s effort and performance. It was truly a one-of-a-kind game. I’m really looking forward to what next year’s game has in stock. Aujourd’hui, des élèves-officiers du CMR, des étudiants de Queen’s et des membres du Second Régiment du Royal Canadian Horse Artillery de Petawawa ont donné vie à l’histoire du hockey à Springer Market Square, au centre-ville de Kingston. 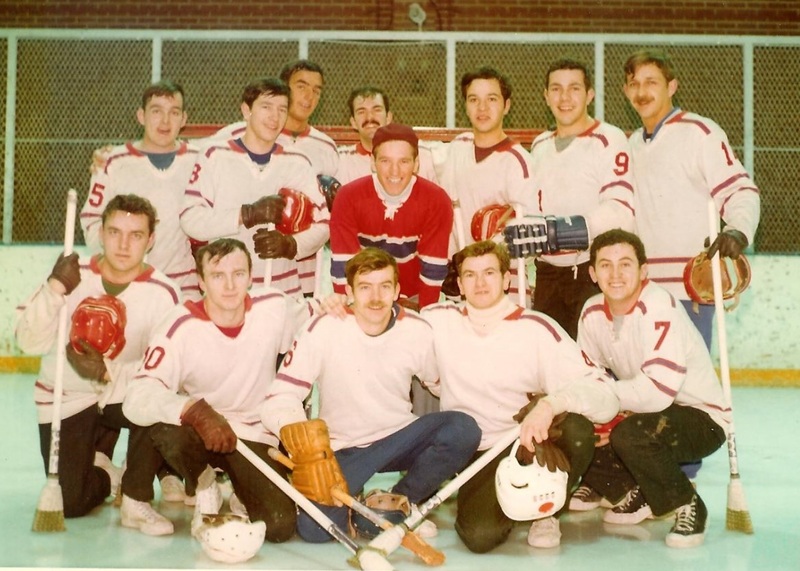 Ils ont réédité ce qui est considéré comme la première partie de hockey organisée entre le CMR et Queen’s en 1886. This past weekend, officer cadets from RMC, students from Queen’s, and members of the Second Regiment of the Royal Canadian Horse Artillery from Petawawa brought hockey history to life at Springer Market Square in downtown Kingston. 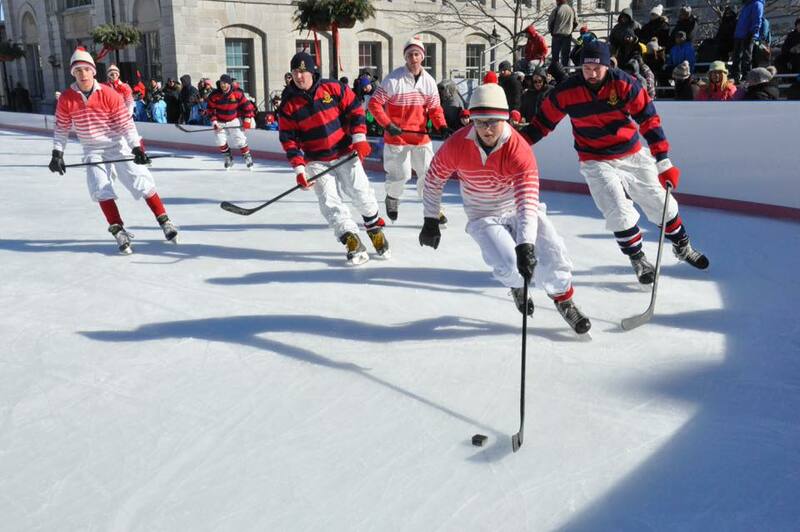 They re-enacted what is considered to be the first organized hockey game played between RMC and Queen’s in 1886. La 45ième édition du Tournoi annuel de ballon sur glace des Ancien(ne)s du CMR s’est déroulé du 25 au 27 janvier au CMRSJ. Trente équipes ont participé au Tournoi. 18 de ces équipes étaient composées d’élèves-officiers, dont 12 de Kingston. Des 6 équipes de Saint-Jean, les Not from Here, était une équipe constituée d’officiers étrangers qui étudient au Collège. Le Tournoi a permis de déterminer que les élèves-officiers forment des équipes très compétitives qui seront difficiles à éloigner de la première marche du podium l’an prochain. Teams were grouped in three different categories. The Competition category was composed of four teams, one of which was Les Remparts from RMCSJ. The Mad Dogs represented RMCC. The recreational category was composed of 20 teams. Some were mixed. Eight came from Kingston, four from RMCSJ (including the Not from Here). The Women’s category was composed of six teams. Three of them came from Kingston and one from RMCSJ. In the Women’s category, Les Sacoches had to beat the RMCSJ officer cadets team to advance to the final. RMCSJ dominated and spent the better part of the game in Les Sacoches’ zone but failed to score. 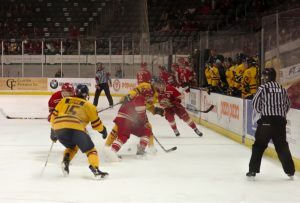 The result of the game had to be decided in overtime which was played 4 against 4 without a goaltender. Experience proved to be a valuable asset and Les Sacoches advanced to face off against the Goal Diggers from RMCC. Les Sacoches battled hard to earn a 1-0 win. 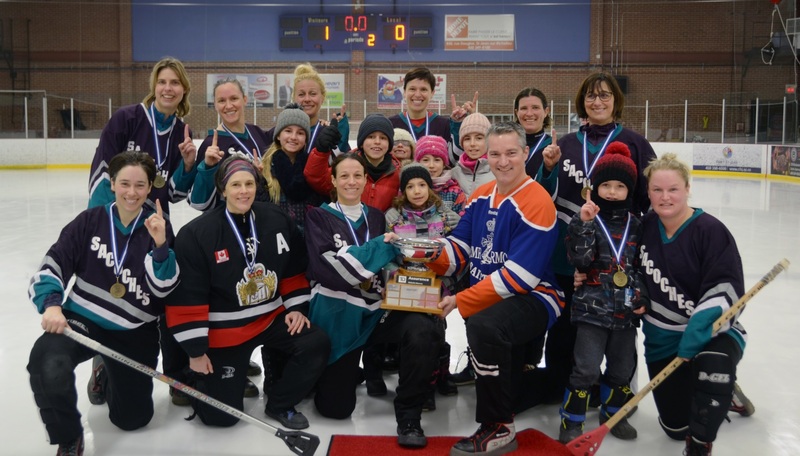 Lucie Trottier scored the winning goal and enabled Les Sacoches to reclaim their championship title from The Chicks with Sticks. 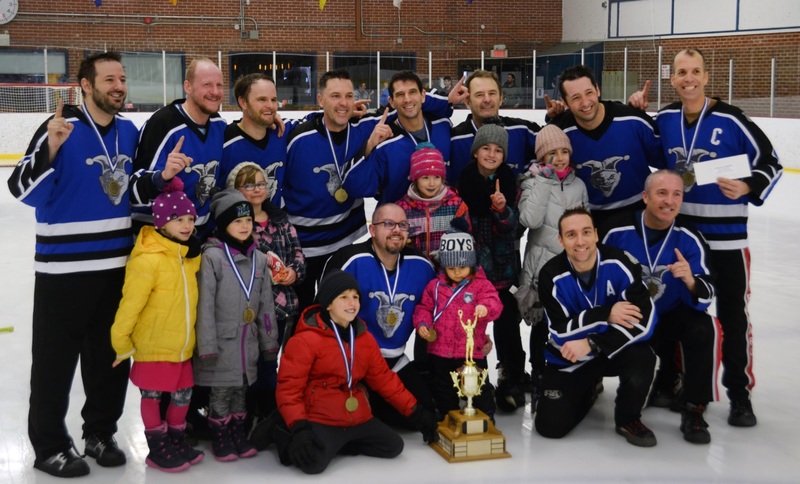 They were awarded the TD Assurance Meloche Monnex Trophy. Both teams received bursary from TD Assurance Meloche Monnex while the MVP, Marie-Josée Blanchette, received a bursary from Michel Laurence, an Ex-Cadet of 1968 entry Class. THE TD ASSURANCE MELOCHE MONNEX TROPHY WAS PRESENTED BY COL GERVAIS CARPENTIER. Dans la catégorie récréative, l’équipe du personnel du CMRSJ a dû vaincre The Blue on Black du CMRC 2-0 (filet ouvert dans les dernières secondes la partie) pour se rendre en finale. Avec le colonel Gervais Carpentier sur la glace comme capitaine d’équipe, ils ont vaincu La Classe à Saddam 4-0 . La Classe à Saddam a fait preuve de vaillance mais, ayant dû ouvrir le jeu après avoir concédé le premier but, a payé cher pour sa hardiesse. L’équipe du personnel du CMRSJ a ainsi succédé aux Vaseux. Le lcol Louis Harnois leur a présenté le trophée Rheinmetall et a aussi présenté une bourse aux deux équipes. Le joueur du match fut Joe Lamontagne, un jeune de 72 ans. La distinction lui a été décernée par ses adversaires. Un beau clin d’œil qui souligne sa longévité et sa valeur sur la patinoire. Il a reçu une bourse offerte par Michel Laurence. L’ÉQUIPE DU PERSONNEL DU CMRSJ S’EST MÉRITÉ LE TROPHÉE RHEINMETALL QUI FUT PRÉSENTÉ PAR LE LCOL LOUIS HARNOIS. Finalement, dans la catégorie compétition, afin de se rendre en finale, Les Remparts du CMRSJ ont battu en période supplémentaire Le Commando nordique, l’équipe championne de la 44ième édition, par le pointage de 2-1. Équipe fort talentueuse, elle a livré une lutte acharnée aux Jeudis dans une finale des plus endiablées mais elle a dû s’incliner par le pointage de 1-0 suite à un but marqué par Réal Cormier. Les Jeudis sont ainsi devenus champions de cette catégorie pour la treizième fois et se sont mérités le trophée du tournoi des Anciens du CMR. Ils ont reçu une bourse offerte par la Corporation du Fort St-Jean. Les Remparts ont reçu une bourse du CÉGEP Saint-Jean-sur-Richelieu. Le joueur du match, Christian Théroux, a reçu une bourse offerte par Michel Laurence. 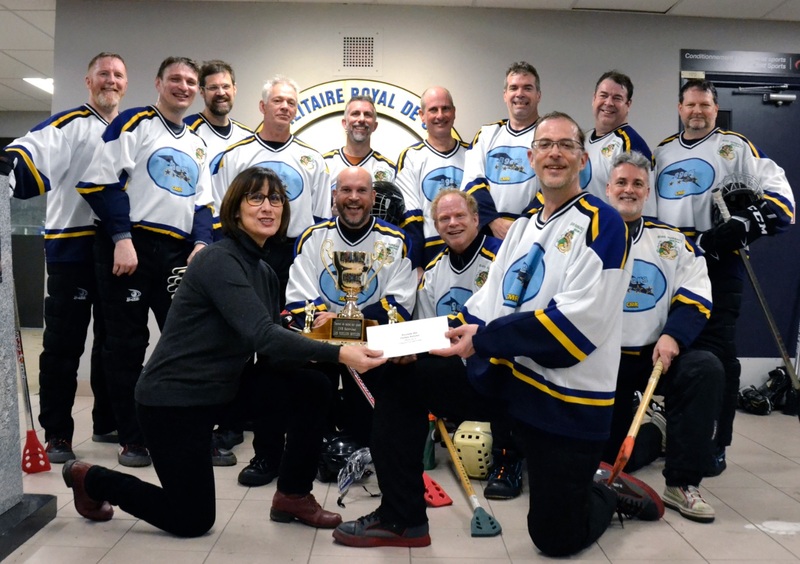 LES JEUDIS POSENT FIÈREMENT AVEC LE TROPHÉE DES ANCIENS DU CMR QUI LEUR FUT PRÉSENTÉ PAR M. STEVE HÉTU, LE DIRECTEUR GÉNÉRAL DE LA CORPORATION DU FORT ST-JEAN. La participation d’équipes d’Ancien(ne)s est naturellement encouragée. À cet effet, le trophée Les vieilles rotules est remis annuellement à l’équipe la plus âgée. Cette année, l’équipe Les 89ers s’est méritée cette distinction. Elle a également reçu une bourse offerte par le Chapitre Fort Saint-Jean du Club des CMR du Canada. Ils transmettent les valeurs héritées des pionniers du tournoi. LES 89ERS REÇOIVENT LE TROPHÉE LES VIEILLES ROTULES ET LEUR BOURSE DES MAINS DE LA PRÉSIDENTE DU CHAPITRE FORT ST-JEAN, MME CAROLYN HUG. The tradition continues thanks to the initiative of our 1975 Pioneers. VOUS LES RECONNAISSEZ? Les finales du dimanche ont couronné une fin de semaine d’exception au cours de laquelle les participants ont pu développer leur esprit compétitif, se divertir et tisser des liens d’amitié. Cette fin de semaine n’aurait pu être une réussite sans le support et la présence des commandants du CMRC et CMRSJ. L’implication du bgén Sébastien Bouchard et du col Gervais Carpentier fut directement responsable d’un tournoi inoubliable. Ne manquez pas le rendez-vous pour la 46ième édition prévue du 24 au 26 janvier 2020. À vos agendas, GO! Discipline. Warrior spirit. Camaraderie. Courage. As men and women who will someday lead Canada’s sons and daughters into the most dangerous trials imaginable, military officers will need to draw upon these traits to achieve mission success. Currently at RMC there is perhaps no other team that better embodies these vital characteristics than the Judo team. 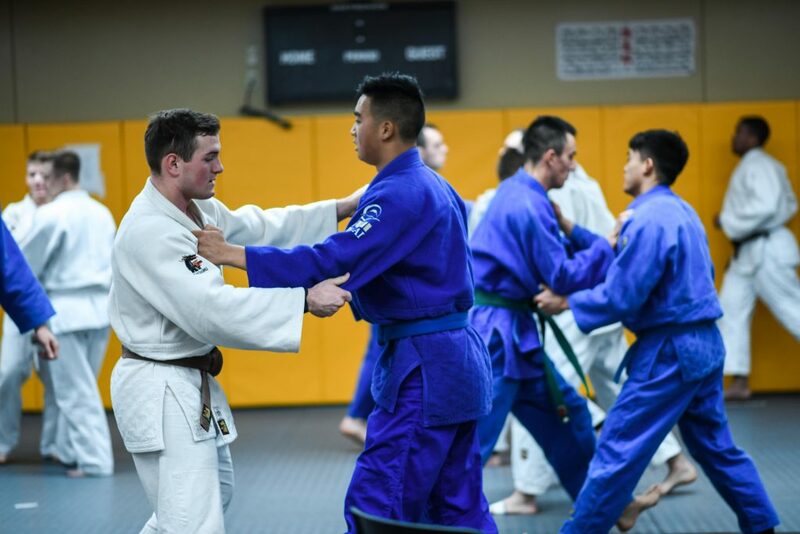 Last semester the team, led by club president Officer Cadet Yeong-Nam Jo, a Third Year infantry Cadet, has devoted countless hours to hone a sport that builds physical robustness, mental agility, and strength of character. Currently, the team has more than 20 members from all years, elements, and academic disciplines. Mastering a complex and physically demanding sport like Judo, of course, takes time and effort. For this, the team practices three evenings a week at their dojo in the base gym and has two additional morning group physical training sessions. Additionally, most of the members take time out of their schedules to practice Judo technique on their own. The Judo team’s commitment, however, does not stop with their busy practice schedule. Last November, the team sent 15 Cadets to participate in weekend tournaments in Toronto and Montreal, competing against athletes from Team Canada and around the world. At these high-skill events, RMC Judo was still able to bring home several medals. Recently, the team sent 17 cadets to compete at the RMC-West Point weekend exchange. Furthermore, the team must balance their devotion to the sport with the demanding requirements of military college. Every Judo team member must also prioritize their schoolwork, military training, second language education and leadership positions. So, what drives them maintain their commitment to Judo? “Knowing how to defend yourself and becoming more fit while doing it is a huge appeal for cadets, as well as being part of a respected discipline” explains OCdt Jared Weir. The team’s success at recent tournaments, as well as the winning attitude of its members, has drawn the attention of world-class Senseis who have begun to volunteer to assist the team. Since they do not have a dedicated coaching staff, the team relies on help from motivated volunteers as well as mentoring from its experienced members. Thus far, Judo has been one of RMC’s most successful athletic teams. Its results at tournaments have rivalled the achievements of any RMC sports team. A feat which is more impressive when considering that the Judo team, which has recreational club status, does not share the same benefits as their competitive or varsity counterparts. Looking forward, the team hopes to earn their competitive status, as well as additional funding to improve their dojo’s equipment and purchase competition standard judogis (uniforms needed to compete in most tournaments). Additionally, they hope to continue to attract Senseis to help develop the team and to hopefully send members to compete in CISM events (Judo is a CISM sport, but Canada does not have a team). Thanks to the dedication of the team’s members, the volunteers who help teach them, as well as the RMC Foundation, RMC Judo has a bright future ahead. Beyond their skill in the 137-year-old sport, this outstanding group of Officer Cadets have developed important qualities that will help to make them highly effective leaders. What are these 3 doing now? I am very pleased to read about the success of the RMC Judo team, and congratulate the team members for their effort and accomplishment. 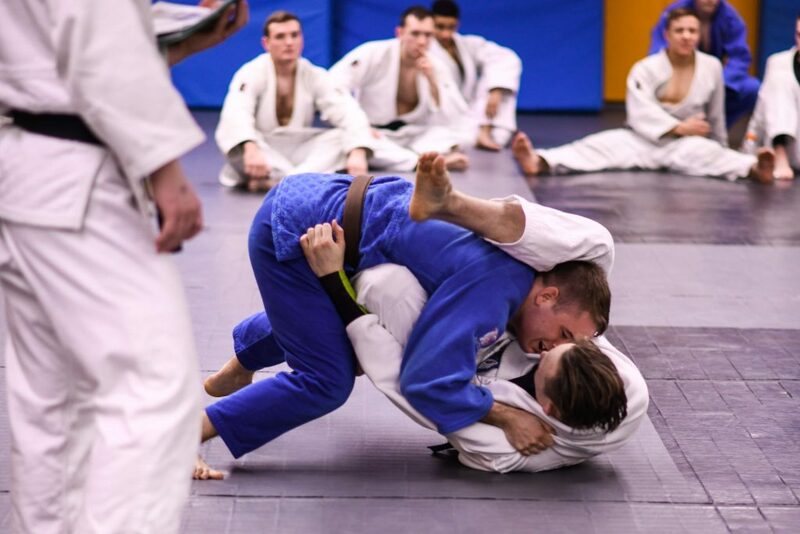 Having done judo myself for nearly 20 years now, I would strongly agree that the practice of judo – and the practice of martial arts more generally – provides an excellent medium for the development of the kinds of leadership qualities the College seeks to instill in its graduates. Looking back 40 years in retrospect, I think it would have been much better to have had an expanded judo program at RMC when I was a cadet back in the 1970’s, as opposed to the time-honoured recruit boxing, that I understand was eventually dropped for good in 1980. I strongly encourage the members of the judo team to keep up the great work they are doing, and wish them every success in the future.